The Rhine River was the last major obstacle 21st Army Group faced in the European war. Even as Operations VERITABLE and BLOCKBUSTER played out, the 2nd British Army prepared for a massive set-piece assault crossing of the river. In keeping with the "broad front" policy of General Eisenhower, strategic priority was given to two assaults, a crossing south of Germany's Ruhr industrial region by the U.S. 9th Army, and the 2nd British Army's crossing north of the Ruhr. Events were forced when the U.S. Army captured an intact bridge near Bonn, at Remagen on 7 March, and the 3rd Army "bounced" the river with a rapid crossing south of Mainz on 22/23 March. Operation PLUNDER, the British crossing planned for 31 March, was accelerated to 23 March. The role of 1st Canadian Army was to hold the Rhine/Maas line from Emmerich to the sea and ensure the Nijmegen bridgehead remained secure. Once across the river, the British and American armies were to drive deep into Germany while the 1st Canadian Army followed along behind, opening up the western Netherlands. The amphibious crossings were done on a two-corps front at Wesel - 30th Corps to the north of 12th Corps. The 9th Canadian Infantry Brigade was attached to the 51st (Highland) Division for the crossing. The Highland Light Infantry of Canada were employed with the 154th Brigade of the 51st (Highland) Division as they crossed the Rhine at Rees and went into action at Speldrop. The HLI went into action to relieve a battalion of the Black Watch, fighting into the 25th and suffering 33 casualties. At the same time, the 1st Canadian Parachute Battalion had landed with the 3rd Parachute Brigade, losing 23 killed, including their Commanding Officer. After the Rhine crossing in March 1945, the First Canadian Army was given two tasks: the liberation of the western Netherlands, and a drive to the North Sea protecting the left flank of the British 2nd Army driving into northern Germany. First Canadian Army became operational at midnight on 1 April 1945, with the 1st Canadian Corps, having arrived from Italy, taking its place under command and the 1st British Corps reverting to command of 2nd British Army. 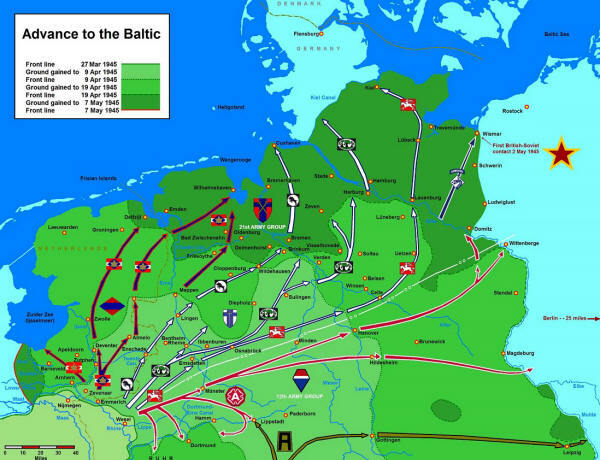 Strategically, on 1 April the 1st and 9th United States Armies completed their encirclement of the Ruhr, Germany's industrial heartland, eventually cutting the pocket in two on 8 April and completing its destruction on 18 April, destroying Army Group B (composed of 5th Panzer Army and 15th Army) and collecting 315,000 prisoners. The 9th U.S. Army returned to American command, having been subordinated to the 21st Army Group during operations in the Rhineland. In the west 1st Canadian Corps attacked to open the Arnhem-Zutphen road, allowing 2nd Canadian Corps to move northeast in support of their goals. Arnhem and Apeldoorn were liberated on 14 and 17 April respectively. Secondary objectives made themselves apparent as the malnutrition rife among the civil population was observed by troops of 1st Canadian Corps, indicating a general famine in the western Netherlands. Wary of prompting German flooding (as had been done at Walcheren), the corps stopped its advance on 22 April and instead negotiated a truce to deliver food to the starving population. The advance of 2nd Canadian Corps to their right was rapid, though enemy resistance was still serious in places, such at Zutphen and along the Twente Canal, where the 3rd Canadian Infantry Division was halted by Infanterie Division 361. The 2nd Canadian Infantry Division also faced considerable opposition, notably at Groningen. The 4th Canadian (Armoured) Division advanced into Germany early in April, reaching the K�sten Canal on the 14th. As the 1st Canadian Corps was engaged in operations in the western Netherlands, the 2nd Canadian Corps was clearing out the last pockets of German resistance in the northwestern Netherlands, and advancing into Germany itself. The 2nd Division crossed the Twente Canal in early April and by 6 April had reached the Schipbeek Canal; the Queen's Own Cameron Highlanders of Canada managed to cross the obstacle with the assistance of small airborne drops of French and Belgian parachutists on 7/8 April. With the 8th Reconnaissance Regiment in the van and the armoured cars of The Royal Canadian Dragoons on the flank, the division reached Beilan on 12 April and took Assen the next day, netting 600 prisoners. On 13 April, the division reached Groningen, the provincial capital where a major battle including Dutch SS troops occupied the entire 2nd Canadian Division for four days. Over 2,000 prisoners were taken at a cost of 209 casualties. In the meantime, the RCD had captured Leeuwarden and reached the North Sea. The 3rd Canadian Division cleared Deventer on 11 April, faced sparse resistance at Zwolle, Meppel and Steenwijk, and sent the divisional reconnaissance battalion at Leeuwarden to find The Royal Canadian Dragoons had beaten them to the punch. In a 26 day, 115 mile advance from the Rhine, the division took 4,600 prisoners and bridged 30 canals. The division was briefly sent east in relief of the 1st Polish Armoured Division in the third week of April, west of the Ems, south of Delfzijl, where the Canadian Scottish and Sherbrooke Fusilier Regiment fought at Wagenborgen before handing responsibility for the Delfzijl Pocket to the 5th Canadian (Armoured) Division. In the meantime, The Algonquin Regiment had moved into Almelo, a town with a population of 35,000. The Argyll and Sutherland Highlanders of Canada had "whisked in and out", and the Alqonquins followed in their wake to determine what enemy was present in and around the town. Suspecting enemy forces in sizeable numbers to the west and south-west, "D" Company was ordered to exploit towards Wierden, 3,000 yards to the west, on 4 April. A reconnaissance party went out in the afternoon to gather information for the company's mission that night, mainly to secure a bridgehead over the canal during a silent operation that night. "C" Company, posted to the south-west portion of the Almelo perimeter, made contact with the enemy also and located one of the German observation posts. 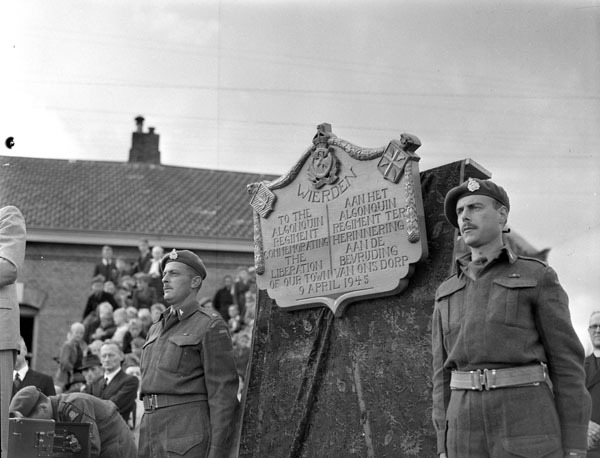 Plaque commemorating The Algonquin Regiment, Wierden, Netherlands, 2 July 1945. (L-R): Major Robert Saville, Major L.C. Taylor. LAC photo. After Operation CLEANSER, the 5th Division moved north to relieve the 3rd Canadian Infantry Division south of Delfzil and ordered to clear the Germans from west of the Ems estuary. The division fought to clear the Delfzijl Pocket between 25 and 30 April. With the port captured, The Irish Regiment of Canada advanced to the west, capturing 4,150 more prisoners in their final actions of the war. German prisoner of war camps, such as Stalag VI C, began to fall to Allied soldiers, as well as concentration camps. German resistance ended by early May, following the fall of Berlin and the suicide of Adolf Hitler. Victory in Europe Day was announced on 7 May 1945 to take effect at one minute past midnight on May 8.